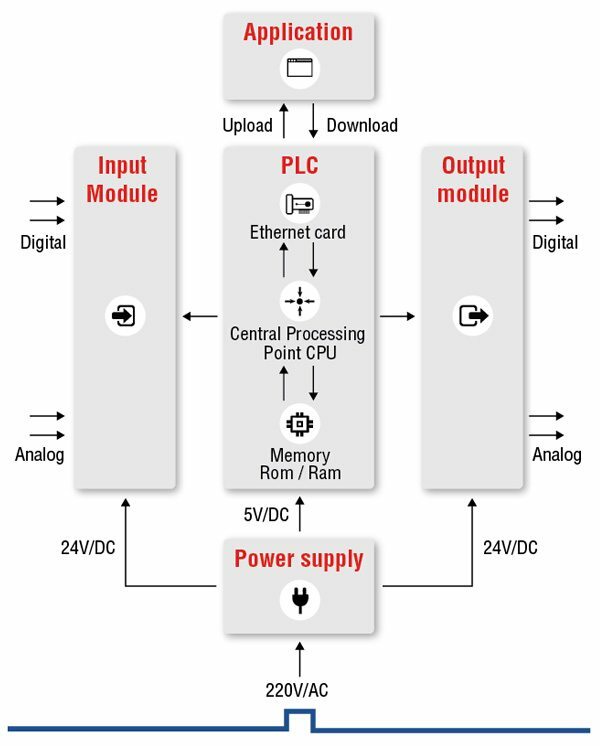 I/O – The PLC’s CPU stores and processes program data, but input and output modules connect the PLC to the rest of the machine; these I/O modules are what provide information to the CPU and trigger specific results. I/O can be either analog or digital; input devices might include sensors, switches, and meters, while outputs might include relays, lights, valves, and drives. Users can mix and match a PLC’s I/O in order to get the right configuration for their application. Communications – In addition to input and output devices, a PLC might also need to connect with other kinds of systems; for example, users might want to export application data recorded by the PLC to a supervisory control and data acquisition (SCADA) system, which monitors multiple connected devices. PLCs offer a range of ports and communication protocols to ensure that the PLC can communicate with these other systems. HMI – In order to interact with the PLC in real time, users need an HMI, or Human Machine Interface. These operator interfaces can be simple displays, with a text-readout and keypad, or large touchscreen panels more similar to consumer electronics, but either way, they enable users to review and input information to the PLC in real time. A PLC program is usually written on a computer and then is downloaded to the controller.